The black and white warp stripes are ikat and the multicoloured warp stripes have been dip-dyed. Only the warp is patterned, the weft is a plain colour. The threads of the warp are set so closely together (40 per cam.) that the weft cannot be seen. All the warps for one piece of fabric are stretched out over the design so that the areas of the pattern that are to remain white can be tied with soft string. When all the tying has been completed the warps are taken to the dye room and dyed with synthetic acid dyes. After the warps have been dried and the ties removed the pattern can be seen in the warps. Dip dying allows numerous colours to be incorporated into a simple stripe. No tying is involved. The warp is first wetted thoroughly and then a portion of it is dipped into a dye, rinsed, followed by another section dipped into a different coloured dye and so-on till the whole warp is dyed. After all the warps have been dyed they are ready to be wound very carefully onto the loom. During the winding–on process the threads shift slightly giving the distinctive blurred edge that occurs between each colour change. The warp is woven on an 8–shaft counter march loom. As the pattern is already in the warp only the simplest weave–plain is necessary. The plain weft is beaten in fairly hard to make a firm cloth. 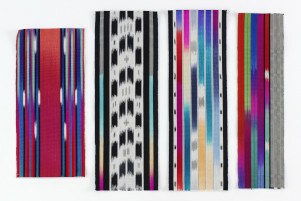 IKAT Samples, Mary Restieaux, c.1980, © Mary Restieaux. Crafts Council Collection: HC510 - HC513. Photo: Relic Imaging Ltd.
IKAT Sample, Mary Restieaux, c.1980, © Mary Restieaux. Crafts Council Collection: HC512. Photo: Relic Imaging Ltd.